A wire fence may not be a thing of beauty, but it isn't meant to be. 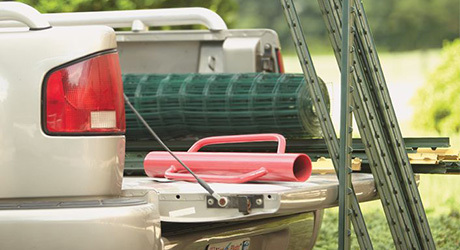 When it comes to fast installation, however, a wire fence is perfect for the job. The quickest are made with metal posts driven into the ground. A sturdier version uses regular wood posts set in holes. This guide walks you through how to build the wood version. Install posts and cut the top rails long enough to span three posts. Nail the rails in place on top of the posts so their ends are on the center of the posts. Then, cut the bottom rails to fit and toenail them into place between the posts. With a helper, unroll enough mesh to reach from end post to end post. Align the end of the mesh with the edge of the post and attach it to the post with fence staples. To prevent sagging, staple the mesh to the top rail every 3 inches, temporarily leaving the bottom unattached. Work your way to the next post. When you reach the post, pull the mesh taut. Starting at the top, staple the mesh to the post every 6 inches with ½-inch or larger staples. When you reach the bottom of the post, work your way back along the bottom rail, stapling the mesh to it as you go. Work your way along the fence, attaching mesh in the same order as before: along the top rail, down the post, then back along the bottom rail. 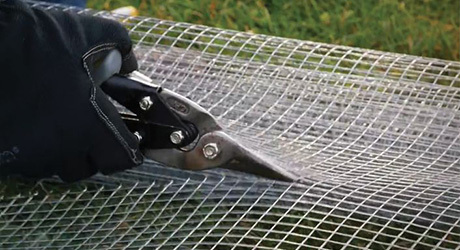 When you reach the end of the roll, use fencing pliers to trim any mesh that extends beyond the post. 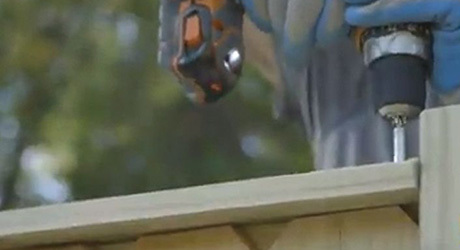 If you need more than one roll of fencing, cut the first roll even with the edge of the post as described in the previous step. Begin the new roll on the same post, positioning it so at least one row of rectangles overlaps those already on the post. 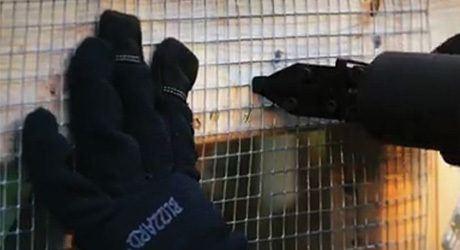 Once you have attached the mesh to the posts and rails, center a 1 × 6 cap rail on the 2 × 4 top rail, positioning the 1 × 6 so the seams between boards never fall above those in the 2 × 4s. Nail the cap rail in place with 10d (3-inch) nails. Metal posts are a quick alternative to wooden posts. 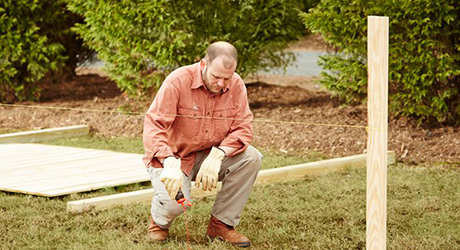 Space metal posts, also known as T-stakes, 8 feet apart and drive them into firm ground. You can use a 3-pound sledgehammer, but you’re better off using a post driver made especially for the job. A post driver is a hollow 2½-foot-long metal tube with handles and a cap at the top. Fit it over the post, lift the tube and ram the top down on the posts. Once all the posts are set, hook the mesh over the hooks on one end post. Pull the mesh taut and then attach it to the next post, working your way from post to post until the fence is complete.